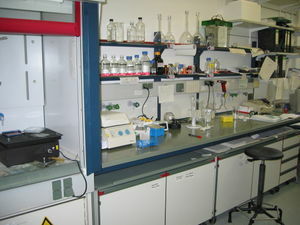 Part of a scientific laboratory at the University of Cologne. There are different points of view regarding the scientific method: Methodological naturalism maintains that scientific investigation must adhere to empirical study and independent verification as a process for properly developing and evaluating natural explanations for observable phenomena. Methodological naturalism typically, therefore, rejects supernatural explanations, arguments from authority and biased observational studies. Critical rationalism instead holds that unbiased observation is not possible and a demarcation between natural and supernatural explanations is arbitrary; it instead proposes falsifiability as the landmark of scientific theories and falsification as the universal scientific method. (This approach has been generalized to pancritical rationalism.) Instrumentalism rejects the concept of truth and emphasizes merely the utility of theories as instruments for explaining and predicting phenomena. Whether mathematics is a science is a matter of perspective. It is similar to other sciences in that it is a careful, systematic study of an area of knowledge — specifically, it focuses on a priori knowledge. Mathematics as a whole is vital to the sciences — indeed, major advances in mathematics have often led to major advances in other sciences. Certain aspects of mathematics are indispensable for the formation of hypotheses, theories, and laws, both in discovering and describing how things work (natural sciences) and how people think and act (social sciences). Science as defined above is sometimes termed pure science in order to differentiate it from applied science, the latter being the application of scientific research to human needs. 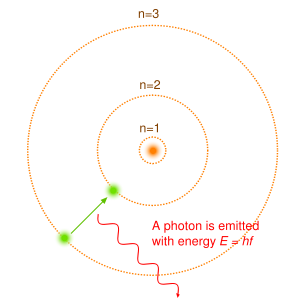 The Bohr model of the atom, like many ideas in the history of science, was at first prompted by and later partially disproved by experiment. The word science comes from the Latin word scientia for knowledge, which in turn comes from scio - I know. The Indo-European root means to discern or to separate, akin to Sanskrit chyati, he cuts off, Greek schizein, to split, Latin scindere, to split. From the Middle Ages to the Enlightenment, science or scientia meant any systematic or exact recorded knowledge. Science therefore had the same sort of very broad meaning that philosophy had at that time. In some languages, including French, Spanish, Portuguese, and Italian, the word corresponding to science still carries this meaning. Sciences versus Science: the plural of the term is often used but is difficult to distinguish in usage without referring to a complex etymology like the above. Therefore it might be helpful to distinguish "sciences" generally as relating to "whole bodies of knowledge" that are separated in some way, as by discipline, subject(s), or most generally, by references meaning without regard to time. From classical times until the advent of the modern era, philosophy was divided into natural philosophy and moral philosophy. In the 1800s, the term natural philosophy gradually gave way to the term natural science. Natural science was gradually specialized to its current domain, which typically includes the physical sciences and biological sciences. The social sciences, inheriting portions of the realm of moral philosophy, are currently also included under the auspices of science to the extent that these disciplines use empirical methods. As currently understood, moral philosophy still retains the study of ethics, regarded as a branch of philosophy and one of the three classical normative sciences. Scientists use models to refer to a description of something, specifically one which can be used to make predictions that can be tested by experiment or observation. A hypothesis is a contention that has been neither well supported nor yet ruled out by experiment. A theory, in the context of science, is a logically self-consistent model or framework for describing the behavior of a certain natural phenomenon. A theory typically describes the behaviour of much broader sets of phenomena than a hypothesis — commonly, a large number of hypotheses may be logically bound together by a single theory. A physical law or law of nature is a scientific generalization based on a sufficiently large number of empirical observations that it is taken as fully verified. Scientific method seeks to explain the complexities of nature in a common, known, and easily replicated way, and to use these explanations to make useful predictions. The scientific method provides an objective process to find solutions to problems in a number of scientific and technological fields. Often scientists have a preference for one outcome over another, and it is important that this preference does not bias their interpretation. The scientific method attempts to minimize the influence of a scientist's bias on the outcome of an experiment. This can be achieved by correct experimental design, and thorough peer review of experimental design as well as conclusions of a study. Scientists never claim absolute knowledge. Unlike a mathematical proof, a proven scientific theory is always open to falsification, if new evidence is presented. Even the most basic and fundamental theories may turn out to be imperfect if new observations are inconsistent with them. Critical to this process is making every relevant aspect of research publicly available, which permits peer review of published results, and also allows ongoing review and repeating of experiments and observations by multiple researchers operating independently of one another. Only by fulfilling these expectations can it be determined how reliable the experimental results are for potential use by others. Isaac Newton's Newtonian law of gravitation is a famous example of an established law that was later found not to be universal - it does not hold in experiments involving motion at speeds close to the speed of light or in close proximity of strong gravitational fields. Outside these conditions, Newton's Laws remain an excellent model of motion and gravity. Since general relativity accounts for all the same phenomena that Newton's Laws do and more, general relativity is now regarded as a better theory. Science is reasoned-based analysis of sensation upon our awareness. As such, the scientific method cannot deduce anything about the realm of reality that is beyond what is observable by existing or theoretical means. When a manifestation of our reality previously considered supernatural is understood in the terms of causes and consequences, it acquires a scientific explanation. Resting on reason and logic, along with other guidelines such as Ockham's Razor, which states a principle of parsimony, scientific theories are formulated and the most promising theory is selected after analyzing the collected evidence. Some of the findings of science can be very counter-intuitive. Atomic theory, for example, implies that a granite boulder which appears a heavy, hard, solid, grey object is actually a combination of subatomic particles with none of these properties, moving very rapidly in space where the mass is concentrated in a very small fraction of the total volume. Many of humanity's preconceived notions about the workings of the universe have been challenged by new scientific discoveries. Quantum mechanics, particularly, examines phenomena that seem to defy our most basic postulates about causality and fundamental understanding of the world around us. Science is the branch of knowledge dealing with people and the understanding we have of our environment and how it works. Some thinkers see mathematicians as scientists, regarding physical experiments as inessential or mathematical proofs as equivalent to experiments. Others do not see mathematics as a science, since it does not require experimental test of its theories and hypotheses, although some theorems can be disproved by contradiction through finding exceptions. (More specifically, mathematical theorems and formulas are obtained by logical derivations which presume axiomatic systems, rather than a combination of empirical observation and method of reasoning that has come to be known as scientific method.) In either case, the fact that mathematics is such a useful tool in describing the universe is a central issue in the philosophy of mathematics. Richard Feynman said "Mathematics is not real, but it feels real. Where is this place? ", while Bertrand Russell quipped, in allusion to the abstraction inherent in the axiomatic method, that "Mathematics may be defined as the subject in which we never know what we are talking about, nor whether what we are saying is true." Mathematics cannot be considered pure science as everything that is mathematically correct may not be physically or practically correct. It is a tool to study various fields of science and to effectively pursue the scientific method. The underlying goal or purpose of science to society and individuals is to produce useful models of reality. John Locke said that it is virtually impossible to make inferences from human senses which actually describe what “is.” On the other hand, people can form hypotheses based on observations that they make in the world. By analyzing a number of related hypotheses, scientists can form general theories. These theories benefit society or human individuals who make use of them. For example, Newton's theories of physics allow us to predict various physical interactions, from the collision of one moving billiard ball with another, to trajectories of space shuttles and satellites. Relativity can be used to calculate the effects of our sun's gravity on a mass light-years away. The social sciences allow us to predict (with limited accuracy for now) things like economic turbulence and also to better understand human behaviour and to produce useful models of society and to work more empirically with government policies. Chemistry and biology together have transformed our ability to use and predict chemical and biological reactions and scenarios. In modern times though, these segregated scientific disciplines (notably the latter two) are more often being used together in conjunction to produce more complete models and tools. One goal of science is to explain and utilize multiple known phenomena with one theory or set of theories. Despite popular impressions of science, it is not the goal of science to answer all questions. The goal of the sciences is to answer only those that pertain to perceived reality. Also, science cannot possibly address nonsensical, or untestable questions, so the choice of which questions to answer becomes important. Science does not and can not produce absolute and unquestionable truth. Rather, science tests some aspect of the world and provides a reasonable theory to explain it. Science is not a source of subjective value judgments, though it can certainly speak to matters of ethics and public policy by pointing to the likely consequences of actions. What one projects from the currently most reasonable scientific hypothesis onto other realms of interest is not a scientific issue, and the scientific method offers no assistance for those who wish to do so. Scientific justification (or refutation) for many things is, nevertheless, often claimed. Of course, value judgments are intrinsic to science itself. For example, scientists value relative truth and knowledge. For a large part of recorded history, science had little bearing on people's everyday lives. Scientific knowledge was gathered for its own sake, and it had few practical applications. However, with the dawn of the Industrial Revolution in the 18th century, this rapidly changed. Today, science has a profound effect on the way we live, largely through its applications in new technology. Other fields of science also play an important role in the things we use or consume every day. Research in food technology has created new ways of preserving and flavoring what we eat (see Food processing). Research in industrial chemistry has created a vast range of plastics and other synthetic materials, which have thousands of uses in the home and in industry. Synthetic materials are easily formed into complex shapes and can be used to make machine, electrical, and automotive parts, scientific and industrial instruments, decorative objects, containers, and many other items. Science is practiced formally, in universities and other institutions that impart science education or pursue research in a branch of science. Science has become a solid vocation in academia. However, informally many more people who are not associated with any university or research institute practice science in their daily life. As people involved in the field of science education often argue that the process of science is performed by all individuals as they learn about their world. For example, science is often practiced by amateurs, who typically engage in the observational part of science. A basic understanding of science and technology has become indispensable for anyone living in a developed country, whether in an urban or rural area, because technology – a product of science – has become an important part of peoples' lives. Science education aims at increasing common knowledge about science and widening social awareness. The process of learning science begins early in life for many people; school students start learning about science as soon as they acquire basic language skills, and science is always an essential part of curriculum. Science education is also a very vibrant field of study and research. Learning science requires learning its language, which often differs from colloquial language. For example, the terminology of the physical sciences is rich in mathematical jargon, and that of biological studies is rich in Latin names. The language used to communicate science is rich in words pertaining to concepts, phenomena, and processes, which are initially alien to children. Due to the growing economic value of technology and industrial research, the economy of any modern country depends on its state of science and technology. The governments of most developed and developing countries therefore dedicate a significant portion of their annual budget to scientific and technological research. Many countries have an official science policy, and many undertake large-scale scientific projects—so-called " big science". The practice of science by scientists has undergone remarkable changes in the past few centuries. Most scientific research is currently funded by government or corporate bodies. These relatively recent economic factors appear to increase the incentive for some to engage in fraud in reporting the results of scientific research , often termed scientific misconduct. Occasional instances of verified scientific misconduct, however, are by no means solely modern occurrences. (see also: Junk science) In the United States, some have argued that with the politicization of science, funding for scientific research has suffered. Science has become so pervasive in modern societies that it is generally considered necessary to communicate the achievements, news, and dreams of scientists to a wider populace. This need is fulfilled by an enormous range of scientific literature. While scientific journals communicate and document the results of research carried out in universities and various other institutions, science magazines cater to the needs of a wider readership. Additionally, science books and magazines on science fiction ignite the interest of many more people. A significant fraction of literature in science is also available on the World Wide Web; most reputable journals and newsmagazines maintain their own websites. A growing number of people are being attracted towards the vocation of science popularization and science journalism. Science is broadly sub-divided into the categories of natural sciences and the social sciences. There are also related disciplines that are grouped into interdisciplinary and applied sciences, such as engineering and health science. Within these categories are specialized scientific fields that can include elements of other scientific disciplines but often possess their own terminology and body of expertise. Examples of diverse scientific specialties include linguistics, archaeology, forensic psychology, materials science, microbiology, nuclear physics and paleontology. The status of social sciences as an empirical science has been a matter of debate in the 20th century, see Positivism dispute. Many areas of inquiry and certain professions have rebranded themselves as sciences for the added aura of seriousness or rigor that the term implies. Actuarial science, computer science and library science, for example, have some claim to use the title because of their grounding in mathematical rigor. Other fields which traffic more in opinion and persuasion, such as political science or creation science (very different fields, to be sure) have perhaps less justification. However, under Karl Popper's definition of science — most importantly falsifiability — these topics would not strictly qualify as science. It should be noted that Kuhn and other philosophers have provided strong arguments against Popper's definition of science, and have questioned whether anything truly fits into it. Learned societies for the communication and promotion of scientific thought and experimentation have existed since the Renaissance period. The oldest surviving institution is the Accademia dei Lincei in Italy. National Academy of Sciences are distinguished institutions that exist in a number of countries, beginning with the British Royal Society in 1660 and the French Académie des Sciences in 1666.
International scientific organizations, such as the International Council for Science, have since been formed to promote co-operation between the scientific communities of different nations. More recently, influential government agencies have been created to support scientific research, including the National Science Foundation in the U.S.